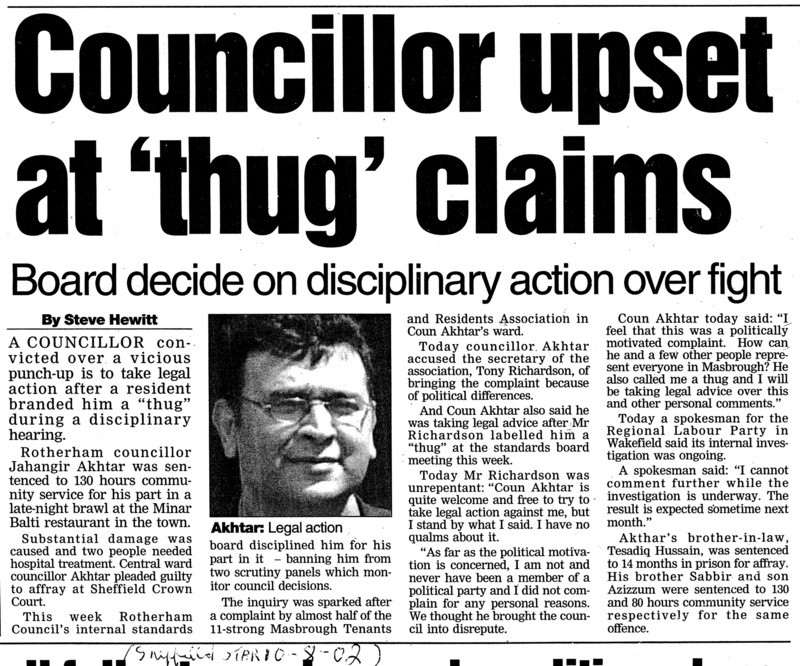 This entry was posted in Jahangir Akhtar and tagged Affray, Jahangir Akhtar, Jahangir Akhtar Affray, Jahangir Akhtar thug, Labour, Labour Chicanery, Labour Party, RMBC, Rotherham Metropolitan Borough Council, Thug, Thuggery by Rik. Bookmark the permalink. Irrespective of all the other issues; Azizzum could have been no more than 20 when that occured – the same age as my youngest son Ben at that time. I could never have looked Ben in the face again if, through my hot-headed behaviour, his future life had been blighted by a criminal record. Azzizum has a conviction for affray, be very interesting to see his CRB check? When your Dad gets you your ‘Jobs’, that may not matter. This man has become an electoral liability for the Rotherham Labour Group, leaving him as the sitting candidate for Rotherham West will hand the ward to UKIP. The tide has changed against this individual, mud sticks and when voters go to place their vote what will spring to mind? Change the candidate or risk the ward going to UKIP. I agree with you 100% This man has now become a liability for the Labour Party. West Ward will be decided between UKIP and the respect party. My money is on Respect. Our Jahangir, has himself, made something of a speciality of complaints to the Police, attempting to enlist them in harassing political opponents! Got a nerve, accusing others of doing it to him. Inducing others to perjure themselves to procure a prosecution, would be another of his nasty little tricks. Wonder if everyone involved in one of his latest ruses, realises just how serious a crime, perjury is, and how much worse it would be if they actually go through with it? Maximum sentence, life! I believe?